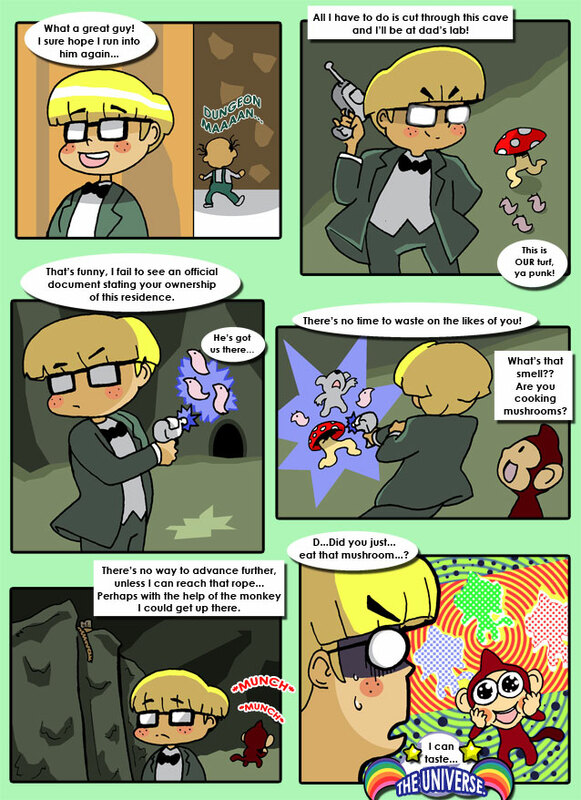 Jeff heads through the cave and Bubble Monkey discovers the magic of mushrooms. Sure, they may have weird side effects, but boy howdy does the universe taste GREAT! Cutting to Ness, we find that he and Reginald still do not get along all that well. However, all those years of pitching gave Ness quite an arm. Just wait until after this is all over and he goes back to little league. The ultimate battle. Mole vs Chicken. Unfortunately, the match is interrupted before it can begin. However, it appears Ness has finally discovered the third strongest mole. He's only interested in the first, though. Jeff rejoins as the chase starts to build up. Also, Titanic Ant finally gets his backstory, only to have it cut short by Ness once again. Even in death the poor guy never gets a break.